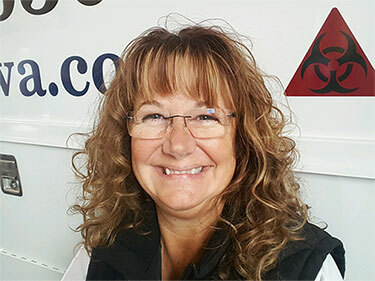 When the worst happens, we are here to help.” — Theresa Borst, President of Bio Clean, Inc.
Bio Clean, Inc., also known as BCI, is a woman-owned business that was founded in 1998 by Theresa Borst. Since that time, BCI has grown considerably and now offers cleanup services across the Western Washington. Our team is mindful of the hurt and trauma that often accompany the need for our services. We work quickly and efficiently to prevent any further trauma to those who have had to deal with an unexpected tragedy such as suicide, homicide, or loss of a loved one who was not found right away. Whether we’re working with Port Authority and a container ship to properly dispose of biohazards trash or a local property manager to clean up an abandoned house, our team responds swiftly to remove the source of any contamination and clean the area so no traces remain. Theresa Borst, the owner and president of Bio Clean, Inc., is focused on providing solutions to real problems facing the community in which she lives and works. In addition to her services, Theresa has taken the initiative to make sure her technicians are prepared for a wide variety of situations. Because of her desire to be part of the solution to challenging situations, Theresa has additional certifications to be prepared to assist the community and her clients in any scenario. She is OSHA Hazardous Waste Operations-Emergency Response Supervisor certified, Trauma Scene Management certified, WISHA certified, as well as Microbial Remediation and Asbestos Abatement certified. Meeting all state requirements, Theresa is also a licensed general contractor in order to completely erase the signs of tragedy from a home during cleanup. In 1998, Theresa formed Bio Clean, Inc. to provide cleanup services to those who had experienced the loss of a loved one to suicide or homicide, and those who were facing cleanup because their loved one’s death had not been discovered quickly. She couldn’t imagine having such a tragedy occur only to have to then deal with unpleasant reminders of a loved one’s passing—such as cleaning up blood or bodily fluids expelled during their passing. It was here that her first mission statement was born; keeping families from being traumatized twice. Since then, she has worked to provide compassion-based services to every client. Whenever the worst happens, Theresa and her team are there to provide compassionate care. The best part of BCI is our team of professionals who have a heart for helping others. We operate from a desire to lessen the trauma to individuals who could be facing multiple situations that could be very traumatizing. We are community-minded and enjoy using our skills and knowledge to help the community and families through difficult situations. As Theresa says often, they are there to help when the worst happens. From cleaning up after an industrial accident to removing contaminants from a meth lab in a home to helping to remove the signs of a loved one lost, our team expertly works to remove the source of any contamination and sanitize in a safe and efficient manner. Our team is also mindful of our clients’ privacy—all information concerning clients is completely confidential.